I have exactly two non-edible plants in the garden. 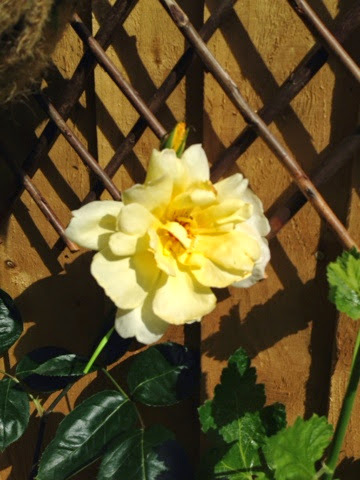 One is the Peony I managed to buy on the last day of the Chelsea Flower Show 2014, and the other is a climbing yellow “Golden showers” rose (well hellllooooo confused google searchers….!). 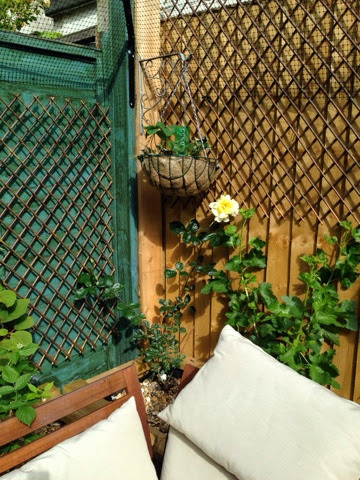 When I was younger, my mother, who was an avid gardener, walled one of our gardens in beautiful dark leaved roses. In the summer the dark green backdrop would be splashed with huge blobs of vibrant yellow blowsy roses that seemed (to my young eyes at least) to be the size of dinner plates. They were beautiful. And I’ve always retained a deep affection for yellow roses. So when I was planning the layout of our edible city garden it was hard to justify any space at all for non-edibles but I couldn’t resist a single climbing rose. Hopefully by next year it’ll have covered a considerable amount of our ugly fencing. For now, I was just enormously thrilled by the appearance of my first flower! And to my delight, it is just as huge and frilly as the ones I remember. Technically a rose is an edible. You can have the rose hips in rose hip tea. And if it is fragrant variety you can make rose petal jam or sugar. Not that I've ever sacrificed my rose petals to such things, but I know I could. It is kind of like my ferns. I put in some lady ferns, because they are an edible variety. Now I've never picked the fiddleheads but maybe some day I will. Daphne – you're quite right of course! One of my cake-making friends makes the prettiest sugar petals and I suppose I've just never thought of using my roses for something like that but hurrah, it means that my whole garden is edible after all! I will sacrifice one symbolic rose then, so that I can't be said to be cheating. Thank you for the hint!